Starting with Samba-3, new group mapping functionality is available to create associations between Windows group SIDs and UNIX group GIDs. The groupmap subcommand included with the net tool can be used to manage these associations. The new facility for mapping NT groups to UNIX system groups allows the administrator to decide which NT domain groups are to be exposed to MS Windows clients. Only those NT groups that map to a UNIX group that has a value other than the default (-1) will be exposed in group selection lists in tools that access domain users and groups. The domain admin group parameter has been removed in Samba-3 and should no longer be specified in smb.conf. In Samba-2.2.x, this parameter was used to give the listed users membership in the Domain Admins Windows group, which gave local admin rights on their workstations (in default configurations). Samba allows the administrator to create MS Windows NT4/200x group accounts and to arbitrarily associate them with UNIX/Linux group accounts. Group accounts can be managed using the MS Windows NT4 or MS Windows 200x/XP Professional MMC tools. Appropriate interface scripts should be provided in smb.conf if it is desired that UNIX/Linux system accounts should be automatically created when these tools are used. In the absence of these scripts, and so long as winbindd is running, Samba group accounts that are created using these tools will be allocated UNIX UIDs and GIDs from the ID range specified by the idmap uid/idmap gid parameters in the smb.conf file. 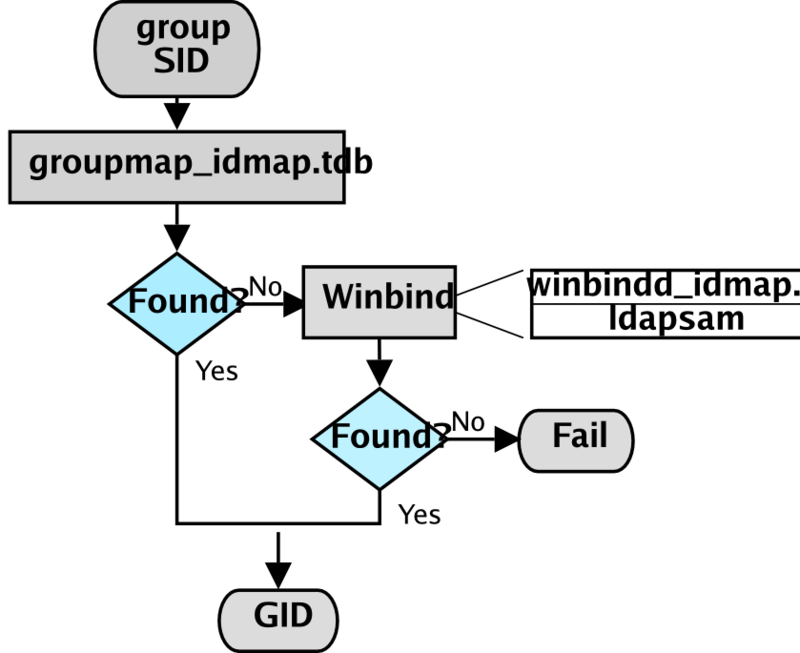 Figure�12.2.�IDMAP: GID Resolution to Matching SID. In both cases, when winbindd is not running, only locally resolvable groups can be recognized. Please refer to IDMAP: Group SID-to-GID Resolution and IDMAP: GID Resolution to Matching SID. 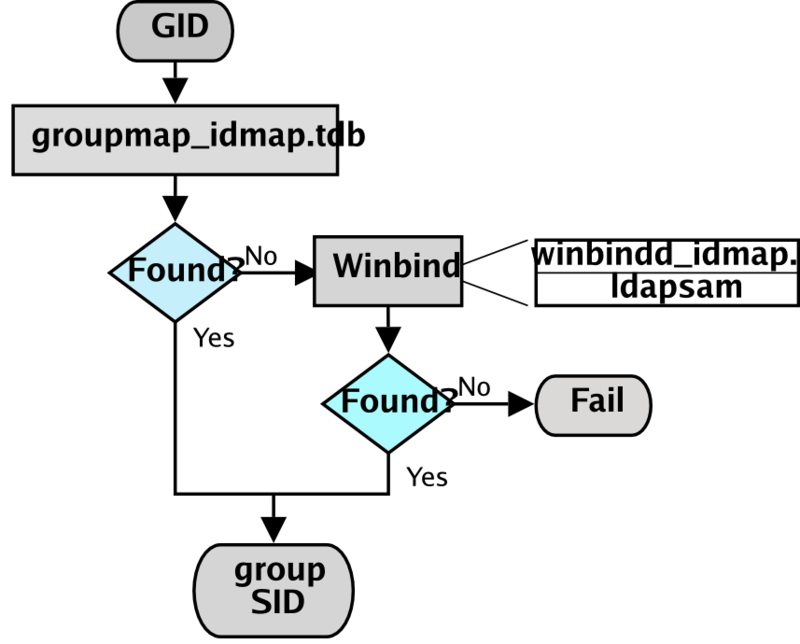 The net groupmap is used to establish UNIX group to NT SID mappings as shown in IDMAP: storing group mappings. Administrators should be aware that where smb.conf group interface scripts make direct calls to the UNIX/Linux system tools (the shadow utilities, groupadd, groupdel, and groupmod), the resulting UNIX/Linux group names will be subject to any limits imposed by these tools. If the tool does not allow uppercase characters or space characters, then the creation of an MS Windows NT4/200x-style group of Engineering Managers will attempt to create an identically named UNIX/Linux group, an attempt that will of course fail. There are several possible workarounds for the operating system tools limitation. One method is to use a script that generates a name for the UNIX/Linux system group that fits the operating system limits and that then just passes the UNIX/Linux group ID (GID) back to the calling Samba interface. This will provide a dynamic workaround solution. Another workaround is to manually create a UNIX/Linux group, then manually create the MS Windows NT4/200x group on the Samba server, and then use the net groupmap tool to connect the two to each other. When you install MS Windows NT4/200x on a computer, the installation program creates default users and groups, notably the Administrators group, and gives that group privileges necessary to perform essential system tasks, such as the ability to change the date and time or to kill (or close) any process running on the local machine. The Administrator user is a member of the Administrators group, and thus inherits Administrators group privileges. If a joe user is created to be a member of the Administrators group, joe has exactly the same rights as the user Administrator. When an MS Windows NT4/200x/XP machine is made a domain member, the “Domain Admins” group of the PDC is added to the local Administrators group of the workstation. Every member of the Domain Admins group inherits the rights of the local Administrators group when logging on the workstation. The following steps describe how to make Samba PDC users members of the Domain Admins group. Create a UNIX group (usually in /etc/group); let's call it domadm. The quotes around “Domain Admins” are necessary due to the space in the group name. Also make sure to leave no white space surrounding the equal character (=). Now joe, john, and mary are domain administrators. The ntgroup value must be in quotes if it contains space characters to prevent the space from being interpreted as a command delimiter. Be aware that the RID parameter is an unsigned 32-bit integer that should normally start at 1000. However, this RID must not overlap with any RID assigned to a user. Verification for this is done differently depending on the passdb backend you are using. Future versions of the tools may perform the verification automatically, but for now the burden is on you. Windows does not permit user and group accounts to have the same name. This has serious implications for all sites that use private group accounts. A private group account is an administrative practice whereby users are each given their own group account. Red Hat Linux, as well as several free distributions of Linux, by default create private groups. When mapping a UNIX/Linux group to a Windows group account, all conflict can be avoided by assuring that the Windows domain group name does not overlap with any user account name. This functionality is known as nested groups and was first added to Samba-3.0.3. All MS Windows products since the release of Windows NT 3.10 support the use of nested groups. Many Windows network administrators depend on this capability because it greatly simplifies security administration. The nested group architecture was designed with the premise that day-to-day user and group membership management should be performed on the domain security database. The application of group security should be implemented on domain member servers using only local groups. On the domain member server, all file system security controls are then limited to use of the local groups, which will contain domain global groups and domain global users. You may ask, What are the benefits of this arrangement? The answer is obvious to those who have plumbed the dark depths of Windows networking architecture. Consider for a moment a server on which are stored 200,000 files, each with individual domain user and domain group settings. The company that owns the file server is bought by another company, resulting in the server being moved to another location, and then it is made a member of a different domain. Who would you think now owns all the files and directories? Answer: Account Unknown. Unraveling the file ownership mess is an unenviable administrative task that can be avoided simply by using local groups to control all file and directory access control. In this case, only the members of the local groups will have been lost. The files and directories in the storage subsystem will still be owned by the local groups. The same goes for all ACLs on them. It is administratively much simpler to delete the Account Unknown membership entries inside local groups with appropriate entries for domain global groups in the new domain that the server has been made a member of. Another prominent example of the use of nested groups involves implementation of administrative privileges on domain member workstations and servers. Administrative privileges are given to all members of the built-in local group Administrators on each domain member machine. To ensure that all domain administrators have full rights on the member server or workstation, on joining the domain, the Domain Admins group is added to the local Administrators group. Thus everyone who is logged into the domain as a member of the Domain Admins group is also granted local administrative privileges on each domain member. UNIX/Linux has no concept of support for nested groups, and thus Samba has for a long time not supported them either. The problem is that you would have to enter UNIX groups as auxiliary members of a group in /etc/group. This does not work because it was not a design requirement at the time the UNIX file system security model was implemented. Since Samba-2.2, the winbind daemon can provide /etc/group entries on demand by obtaining user and group information from the domain controller that the Samba server is a member of. In effect, Samba supplements the /etc/group data via the dynamic libnss_winbind mechanism. Beginning with Samba-3.0.3, this facility is used to provide local groups in the same manner as Windows. It works by expanding the local groups on the fly as they are accessed. For example, the Domain Users group of the domain is made a member of the local group demo. Whenever Samba needs to resolve membership of the demo local (alias) group, winbind asks the domain controller for demo members of the Domain Users group. By definition, it can only contain user objects, which can then be faked to be member of the UNIX/Linux group demo. net rpc group addmem demo "DOM\Domain Users"
Having completed these two steps, the execution of getent group demo will show demo members of the global Domain Users group as members of the group demo. This also works with any local or domain user. In case the domain DOM trusts another domain, it is also possible to add global users and groups of the trusted domain as members of demo. The users from the foreign domain who are members of the group that has been added to the demo group now have the same local access permissions as local domain users have. For Samba-3 domain controllers and domain member servers/clients. To manage domain member Windows workstations. Versions of Samba up to and including 3.0.10 do not provide a means for assigning rights and privileges that are necessary for system administration tasks from a Windows domain member client machine, so domain administration tasks such as adding, deleting, and changing user and group account information, and managing workstation domain membership accounts, can be handled by any account other than root. Samba-3.0.11 introduced a new privilege management interface (see User Rights and Privileges) that permits these tasks to be delegated to non-root (i.e., accounts other than the equivalent of the MS Windows Administrator) accounts. Administrative tasks on a Windows domain member workstation can be done by anyone who is a member of the Domain Admins group. This group can be mapped to any convenient UNIX group. Administrative tasks on UNIX/Linux systems, such as adding users or groups, requires root-level privilege. The addition of a Windows client to a Samba domain involves the addition of a user account for the Windows client. Many UNIX administrators continue to request that the Samba Team make it possible to add Windows workstations, or the ability to add, delete, or modify user accounts, without requiring root privileges. Such a request violates every understanding of basic UNIX system security. There is no safe way to provide access on a UNIX/Linux system without providing root-level privileges. Provision of root privileges can be done either by logging on to the Domain as the user root or by permitting particular users to use a UNIX account that has a UID=0 in the /etc/passwd database. Users of such accounts can use tools like the NT4 Domain User Manager and the NT4 Domain Server Manager to manage user and group accounts as well as domain member server and client accounts. This level of privilege is also needed to manage share-level ACLs. When first installed, Windows NT4/200x/XP are preconfigured with certain user, group, and alias entities. Each has a well-known RID. These must be preserved for continued integrity of operation. Samba must be provisioned with certain essential domain groups that require the appropriate RID value. When Samba-3 is configured to use tdbsam, the essential domain groups are automatically created. It is the LDAP administrator's responsibility to create (provision) the default NT groups. Each essential domain group must be assigned its respective well-known RID. The default users, groups, aliases, and RIDs are shown in Well-Known User Default RIDs. It is the administrator's responsibility to create the essential domain groups and to assign each its default RID. It is permissible to create any domain group that may be necessary; just make certain that the essential domain groups (well known) have been created and assigned their default RIDs. Other groups you create may be assigned any arbitrary RID you care to use. Be sure to map each domain group to a UNIX system group. That is the only way to ensure that the group will be available for use as an NT domain group. For complete details on net groupmap, refer to the net(8) man page. Everyone needs tools. Some of us like to create our own, others prefer to use canned tools (i.e., prepared by someone else for general use). A script to create complying group names for use by the Samba group interfaces is provided in smbgrpadd.sh. This script adds a temporary entry in the /etc/group file and then renames it to the desired name. This is an example of a method to get around operating system maintenance tool limitations such as those present in some version of the groupadd tool. # Add the group using normal system groupadd tool. # Now return the GID as would normally happen. The smb.conf entry for the above script shown in the configuration of smb.conf for the add group Script demonstrates how it may be used. add group script = /path_to_tool/smbgrpadd.sh "%g"
In our example we have created a UNIX/Linux group called ntadmin. Our script will create the additional groups Orks, Elves, and Gnomes. It is a good idea to save this shell script for later use just in case you ever need to rebuild your mapping database. For the sake of convenience we elect to save this script as a file called initGroups.sh. This script is given in intGroups.sh. Of course it is expected that the administrator will modify this to suit local needs. For information regarding the use of the net groupmap tool please refer to the man page. Versions of Samba-3 prior to 3.0.23 automatically create default group mapping for the Domain Admins, Domain Users and Domain Guests Windows groups, but do not map them to UNIX GIDs. This was a cause of administrative confusion and trouble. Commencing with Samba-3.0.23 this annomaly has been fixed - thus all Windows groups must now be manually and explicitly created and mapped to a valid UNIX GID by the Samba administrator. At this time there are many little surprises for the unwary administrator. In a real sense it is imperative that every step of automated control scripts be carefully tested manually before putting it into active service. This is a common problem when the groupadd is called directly by the Samba interface script for the add group script in the smb.conf file. The most common cause of failure is an attempt to add an MS Windows group account that has an uppercase character and/or a space character in it. There are three possible workarounds. First, use only group names that comply with the limitations of the UNIX/Linux groupadd system tool. Second, it involves the use of the script mentioned earlier in this chapter, and third is the option is to manually create a UNIX/Linux group account that can substitute for the MS Windows group name, then use the procedure listed above to map that group to the MS Windows group. Click Start -> Control Panel -> Users and Passwords. Double-click Power Users. This will launch the panel to add users or groups to the local machine Power Users group. Select the domain from which the Domain Users group is to be added. Double-click the Domain Users group. Click the OK button. If a logon box is presented during this process, please remember to enter the connect as DOMAIN\UserName, that is, for the domain MIDEARTH and the user root enter MIDEARTH\root.